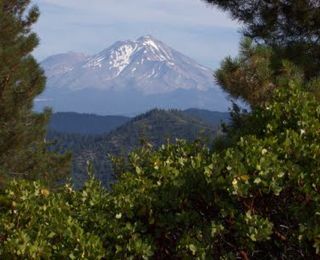 THPBlog: Sierra Pacific Industries to clearcut log near Shasta Lake and the West Girard roadless area. Sierra Pacific Industries to clearcut log near Shasta Lake and the West Girard roadless area. THP 2-13-032 SHA (Salt Flat THP) Sierra Pacific Industries, 460 acres; 58% shelterwood, 41% clearcut logging. North Salt Creek (MD: T36N R4W Sec.5; T36N R5W Sec.1; T37N R4W Sec.33). Winter operations, high erosion hazard, steep slopes up to 70%, herbicides, adjacent to west girard roadless area, 1 spotted owl within 1.3mi, foothill yellow legged frog & western pond turtle sightings, trees up to 48” dbh. Estimated public comment deadline: 09/05/13. This THP is a few miles east of I-5 and just north of Shasta Lake at an elevation of 1,600 to 3,400 feet. Sierra Pacific Industries is planning a tractor and cable logging operation to remove Douglas fir, true fir and ponderosa pine overstory and clearcut. The units in section 33 are also close to the West Girard roadless area. 7 road drainage work sites are planned where rocked dips will be installed. There were 3 foothill yellow legged frog sightings reported within .1, .2 and .3 mi. of the THP, and 1 western pond turtle was seen within .6mi of the THP. There is also a northern spotted owl territory within .5mi of the THP. More information is available on the THP Tracking Center website.